The MISSOURI WATERCOLOR SOCIETY held its 2018 INTERNATIONAL EXHIBITION in Qingdao, China from June 15th through July 7th. This was the first time the Missouri Watercolor Society has held its annual International Juried Exhibition outside the United States and possibly the first of any US Watercolor Society to hold an International Exhibit outside of the states. 217 member artists from six countries were selected from the exhibition entrants. The Judge of Selection for those artists from the United States was Laurin McCracken, AWS. The Chinese Judges of Selection were Mr. Jian Chu, Mr. Long Ping and Mr. Huizhan Li. The Judges of Awards for the exhibition were: Mr. Weixing Guan, an internationally awarded watercolorist, Royal Watercolour Society and AWS; Mr. Dongfeng Li, an internationally awarded watercolorist, AWS and tenured Professor of Art at Morehead State University and Mr. Huizhan Li, the Director of the Qingdao Laotian Museum. 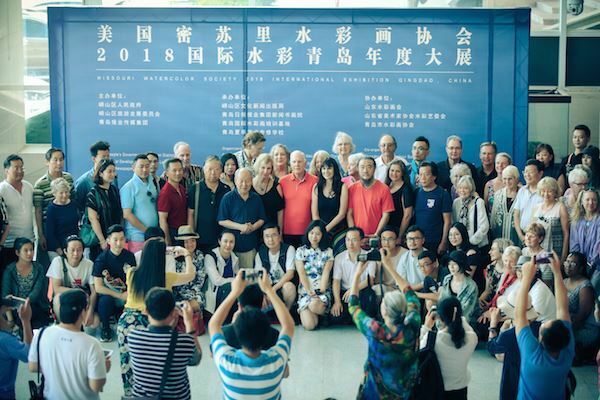 The Awards Ceremony held on July 7th was attended by the three Judges of Awards, countless Chinese officials, local art lovers and the forty-four American and Canadian artists and spouses who had spent the previous 2 fabulous weeks touring and painting their way through China. The tour had been arranged by Dongfeng Li and led by him and Mr. Daven Anderson. The exhibition was hung in the beautiful and expansive galleries of the Qingdao Laotian Art Museum. The approximate $20,000 in awards were listed on a large wall panel and the artists and their paintings were celebrated in a short talk by Daven Anderson, the Executive Director of the Missouri Watercolor Society, and by Mr. Huizhan Li, the Museum Director. The exhibition attracted considerable attention in China. The exhibition’s hosts were: The People’s Government of Laotian District, The Tourist Development Council of the Laotian District and the Qingdao Newspaper Media Group. The Organizers were: The Culture Press and Publication Bureau of Qingdao Laotian District, the Art Institute of the Qingdao Newspaper Group, the Qingdao International Watercolour Training Center, the Qingdao Summer Art School, the Qingdao Watercolour Society, the Shandon Watercolour Society and the Watercolour Art Committee of the Shandon Artists Association.